One of the enduring mysteries of life is the other washroom. Public lavatories remain a bastion of seg­regation as well as a haven of modesty. They have recently become a battleground for gen­der equality over the issue of annoyingly one-sided queues. 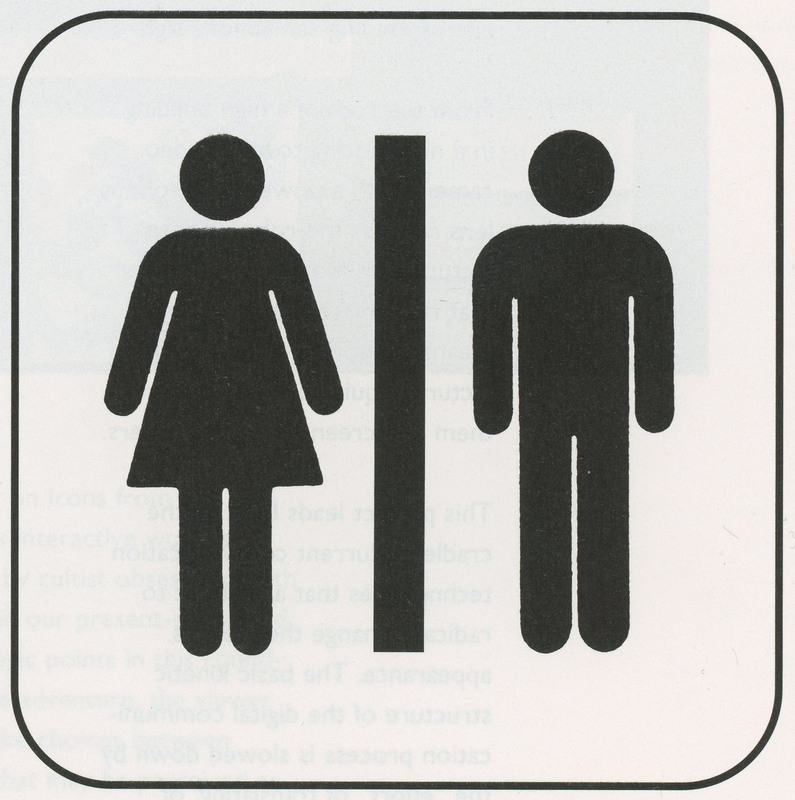 A charged nexus of privacy and par­ity, rest rooms provide a suitable sanctuary from which to contem­plate social issues facing a tele­-computed world. Will cyberspace infiltrate this bifurcated domain? Computers and telecommunica­tions are converging in an alliance that challenges some of the most fundamental parameters of social interaction. Rest Rooms is an interactive installation designed to provoke thought about changes in our understanding of privacy and gender, and to provide a forum in which social and political ques­tions can be raised: What will pri­vacy be like in cyberspace? Will limits still be drawn to establish a personal space, and if so, where will the boundaries fall? The installation consists of two computers installed in a rest room outfitted with video cam­eras and connected in a network. The screen of each computer is divided into four regions. One region displays a small video image from the camera located at that site. A larger area displays an image from the video camera in the other rest room. This enables people in each rest room to see and talk with people in the other rest room. A third region is a common “graf­fiti” space, in which people in both locations can write or draw simultaneously on their common “bulletin board”. The fourth region continuously runs Quicktime movies of snippets from gender-related television advertising. This installation offers a forum in which participants can discuss existing and future spatial, political, and social demarcations that separate the sexes.